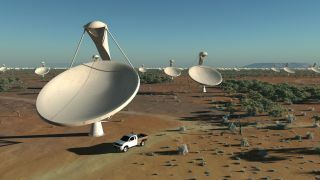 The world's largest and most sensitive radio telescope will be shared by South Africa and Australia, project organizers announced today (May 25). The SKA's many receptors will be arrayed in spiral arms extending out at least 1,864 miles (3,000 kilometers) from a central core, officials have said. The 1.5-billion-euro (roughly $2 billion) construction project is slated to begin in 2016, with the SKA's first science operations starting three years later. The array is expected to be fully operational by 2024.